Long before celebrities such as actor Alan Alda and astrophysicist Neil deGrasse Tyson became hosts of science programs on public television, there was John Fitch. 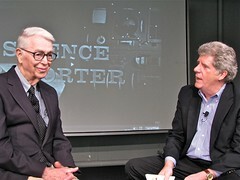 From 1963 through 1966, the understated, deep-voiced Fitch provided introductions and interviews for one of the world's first televised programs devoted to exploring science and technology, a co-production of MIT and WGBH called MIT Science Reporter. In over 100 programs produced on a relative shoestring, he interviewed some of the most prominent figures in their fields of the mid-20th Century for the now little-remembered National Educational Television (NET), the forerunner of PBS. In half-hour segments shot in black-and-white videotape in a single day, Fitch asked scientists and engineers to provide explanations of their work that could be easily understood by a general audience. 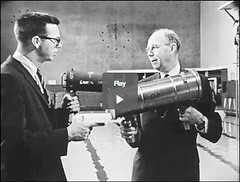 Among his interview subjects were Harold "Doc" Edgerton, the "father of high-speed photography," hydrogen bomb co-developer Stanislaw Ulam, psychologist Jerome Bruner, a leader of the "Cognitive Revolution" of the 1960s, Nobel Prize-winning physicist Charles Townes, architectural designer and futurist Buckminster Fuller and Vannevar Bush, presidential science adviser and a man who played a key role in the Manhattan Project and creation of the National Science Foundation. Now in his 80's, Fitch recently returned to MIT for a program at the MIT Museum that looked back at his landmark series. In a discussion led by Lawrence Gallagher, director of MIT Video Productions, audience members watched clips of of Fitch interviewing his subjects and listened as he talked about the ups and downs of his experiences asking seminal figures of their time to talk about their work in interviews so lengthy they would be unthinkable in today's fast-paced medium. Sitting in front of a screen projection of himself as the MIT Science Reporter, Fitch seemed remarkably unchanged, still wearing squarish, dark-rimmed glasses, his voice as resonant as ever. Born in Shanghai to a father who was a Methodist missionary, his family had to flee China when the Japanese invaded in 1937. Always interested in science, he wanted to go to Caltech until he heard about Edgerton's work as a teenager at a prep school in Lake Placid, N.Y. and from that point on, his ambitions turned to Cambridge. He entered MIT with the class of 1943, but his eventual graduation was delayed by wartime service in the Navy. It was as an undergraduate that Fitch became involved with broadcasting, doing some work for the Boston station WHDH and then after getting his degree, moving to WGBH. Debuting in May of 1955, WGBH-TV (Channel 2) was the first public broadcasting station in New England, with studios initially located on the MIT campus, near where the Stratton Student Center is now on Massachusetts Avenue (GBH stands for "Great Blue Hill," the location of the original TV transmitter--and not, as the old joke goes, for "God Bless Harvard.") After that facility burned down in 1961, the station moved around until it secured a new location in Allston, where it stayed until moving to Brighton in 2007. 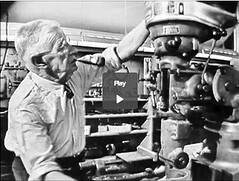 When MIT and WGBH came up with the idea for the science series, Fitch was paired with another pioneer of public television, director/producer Russell Morash, who would go on to acclaim as the founding producer of such mainstays of public television as This Old House, The New Yankee Workshop and the Victory Garden, as well as a program called The French Chef, featuring a Cambridge-based cookbook author with a quirky voice named Julia Child. "He was probably the best director WGBH ever had," Fitch said of Morash. Unlike the instantly recognizable Alda (Scientific American Frontiers) and the ebullient Tyson (NOVA scienceNOW), who tend to take center stage in their respective programs, Fitch comes across in MIT Science Reporter as a low-key interviewer who keeps the focus firmly on his subjects. As he recalled, sometimes his anonymity made it harder for him to draw those he talked to into an engaging discourse. The Nobelist Townes, for instance, "didn't know me from Adam" and made it clear he had a busy schedule. "With some people, I was really out of my depth," he admitted. And with others, "You'd ask a nice long question, and the answer you would get would be 'yes,' or 'no.' " But then, there were figures such as Buckminster Fuller, who was an interviewer's dream. "With him, it was like pushing a button, and he'd just talk," Fitch said with a laugh. Beyond obstacles involving the interviewees, there were considerable technical hurdles facing the production team in those days before wireless microphones and smaller, more mobile television cameras. Fitch had to wear a microphone around his neck and he was tied, umbilical cord-like, through cables to the large, cumbersome cameras. That proved especially challenging in some settings, such as the time he interviewed his boyhood idol, "Doc" Edgerton, in the tight quarters of what was then the MIT Pool for an episode on underwater photography. The budget constraints also presented problems. At the time, the videotape they used was so expensive that doing multiple takes was mostly out of the question. "I would come in three or four days before to meet the guest," Fitch said, but the taping had to be done in one day. There was the occasional disaster: "Once a light fell down right into the middle of the experiment we were discussing and destroyed it." There was no money for the production team to travel too far from MIT, until NASA came up with a grant to do 13 episodes. "That allowed us to travel all over the United States," Fitch said. "That was wonderful." For those who would like to see some of the MIT Science Reporter episodes, the university has posted nine programs on its TechTV website. 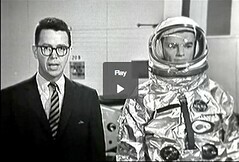 They include the Edgerton program (Underwater Photography, 1964); an interview with Vannevar Bush at his home in Belmont (Looking Back at the Bomb, 1963); an examination of the guidance navigation systems for the Apollo spacecraft (Computer for Apollo,1965); and interviews with space food scientists at the U.S. Army Laboratories in Natick (Food for Space Travelers,1966). Fitch said the MIT Science Reporter series ended in 1966, "not with a bang, but a whimper," after Morash moved on to the The French Chef and it seemed to him that the program had run its course. Subsequently, he worked for a computer control systems company and then for a firm that produced science films. He was surprised to learn that, contrary to what he thought--that only a few tapes of his program still existed--the MIT Museum has 70 episodes in its collection that are being preserved and archived. Asked what he thought about today's science programs, with their special effects, high-profile hosts and, of course, color, Fitch's answer was, in effect, not much. "I'm not impressed, because they don't go into depth," he said, "I like the concept of what we did." Explore parts unseen at the Harvard Observatory.